Click on any image to view full screen and then use your back button to return to this post. Sitting in the town square in Ghent on a Saturday afternoon in May, with the sun beating down, my frustration was palpable: today was beautiful, but tomorrow was forecast to be awful. Sod and law were playing their games again. 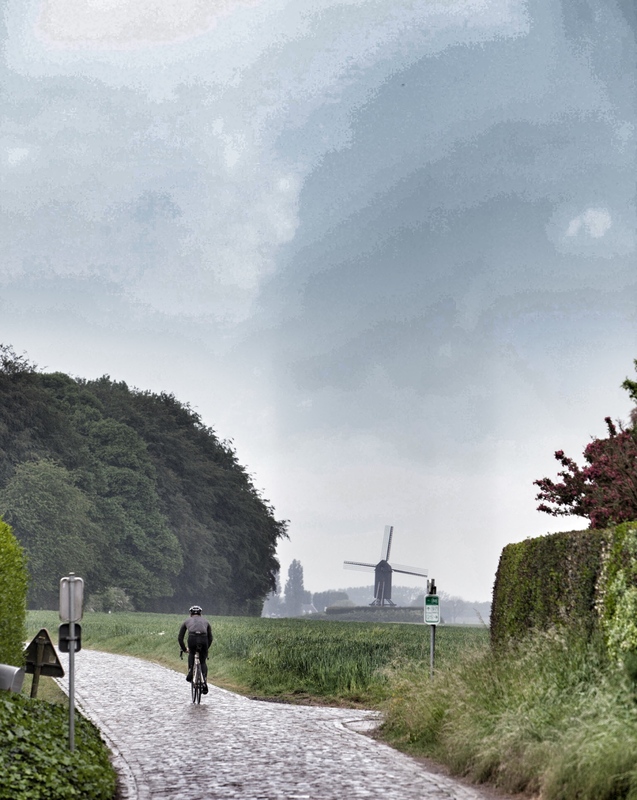 A voice laughed at me inside my head: “Hard luck mate”: tomorrow’s date with the cobbles and bergs of the Tour of Flanders, or the Ronde Van Vlaanderen as the locals call it, was set in stone. Deep down in the pit of my stomach, I was nervous. Wet cobbles and bikes don’t mix easily. 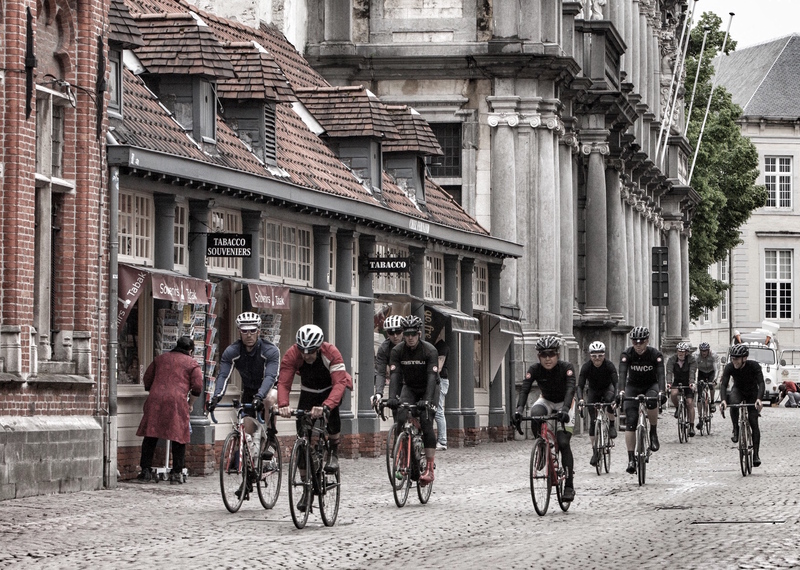 Along with Simon, a friend from home, I’d driven over to Belgium that afternoon to dip into an inaugural Rapha Travel event – the Cent Cols Classics. I say ‘dip’ because my diary was tight and I only had time to join the first two days of the seven day event. A Cent Cols is a marginal undertaking at the best of times, but quietly, I was of the view that this might just be the most extreme Cent Cols ever planned. And that was in spite of the fact that it didn’t even include any mountains! The concept was born of the mind of Phil Deeker, founder of the Cent Cols Challenge and legendary endurance cyclist and mountain man. Even by his standards, it was an audacious plan: to ride the full route of six of the local ‘Classics’ – the Tour of Flanders, Gent-Wevelgem, Paris-Roubaix, Amstel Gold, Fleche Wallone and Liege-Bastogne-Liege. That would add up to over 1,500km of incredibly taxing riding in just six days. Even with a rest day scheduled in between Paris-Roubaix and Amstel Gold, I thought this itinerary looked highly improbable. To succeed, all the other variables, most notably the weather, would need to be stacked in our favour. 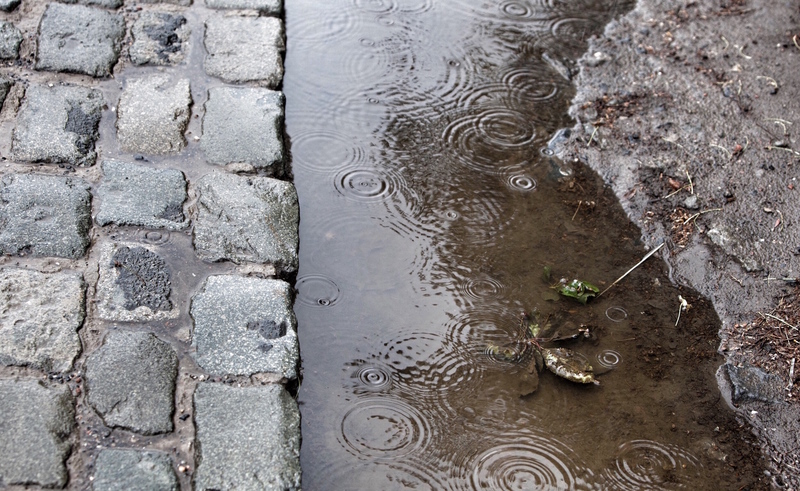 What we really didn’t want was wet cobbles. And so, on a Saturday evening in the basement of a nondescript hotel in Ghent, a handful of riders listened nervously to Phil’s briefing, particularly the talk about rain and the revelation that the last people to attempt this same set of rides had failed, even though they’d taken a rest day in between each one!!! I awoke to the sound of rain and dressed accordingly. Sometime later I would land on the not-so-new-revelation that both Castelli Gabba and Rapha Shadow are wonderful inventions. I almost crashed within the first fifty meters as my rear wheel went sideways on a set of cobbles. Somehow I saved it. The 50km run out to Bruges was wet and dirty. Phil had plotted a route that would cover both the full distance of the pro race (or 267km for us) and every climb it’s ever been famous for. There would be no ‘Ronde minus a famous climb or two’ problems for us and no need for circuit laps. We settled into the task and got to know each other a little, spitting grit from our mouths. I was increasingly impressed by some of the people around me: ex pros, racers, endurance athletes. This was a strong team. So far the rain was only intermittent and I wondered, hopefully, whether it might hold off? It was almost 100km before we hit the first set of cobbles and thankfully, they were dry. They seemed OK – alien, but workable. 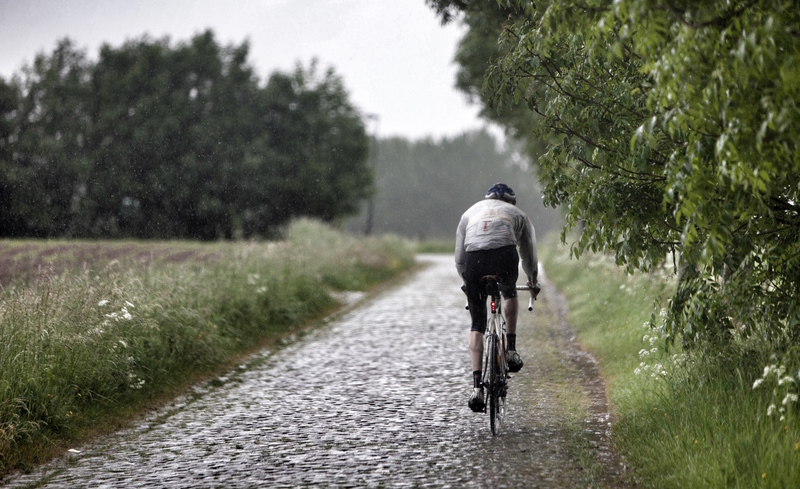 They were nothing like Roubaix cobbles, which could never be described as workable, nor OK.
And then it started to rain. Not hard, yet, but enough to soak everything. The next long set of gently rising and falling cobbles felt a lot less OK.
What no one tells you about the Tour of Flanders is that there are some long stretches of flat cobbles. Except they’re not quite flat. They rise and then fall. And as they fall, so your speed increases. Normally you’d simply brake if you were uncomfortable with the speed of a descent, but not on wet cobbles. To brake is to invite disaster. But if you don’t brake, you end up doing 40, or 50kmh on a surface that feels as slippery as ice. It was, frankly, terrifying and there was another 150km of it to go. Somewhere behind me, on the stretch known as Haaghoek, Simon crashed. He lost a little skin and broke a bottle cage, but remounted and rode onwards. To be fair to Simon, I think eight of the eleven riders crashed before the end of the day. Simon is one of those riders who makes me jealous: he’s a very talented cross-county runner, weighs nothing, has long levers and climbs hills in a way I can only dream of. He was made to ride bikes. However, he only came to cycling a few years ago and he’d never attempted a ride of this length, nor had he experienced cobbles before. I’d mentioned the trip just a few weeks before and in a rash moment, he’d agreed to join me. At this moment, he was the very definition of ‘in at the deep end’ and I feared he was probably regretting his decision! The rain came and went, for the time being. We hit the first of the cobbled climbs, the Molenberg, and everyone cleaned it, because it was dry. 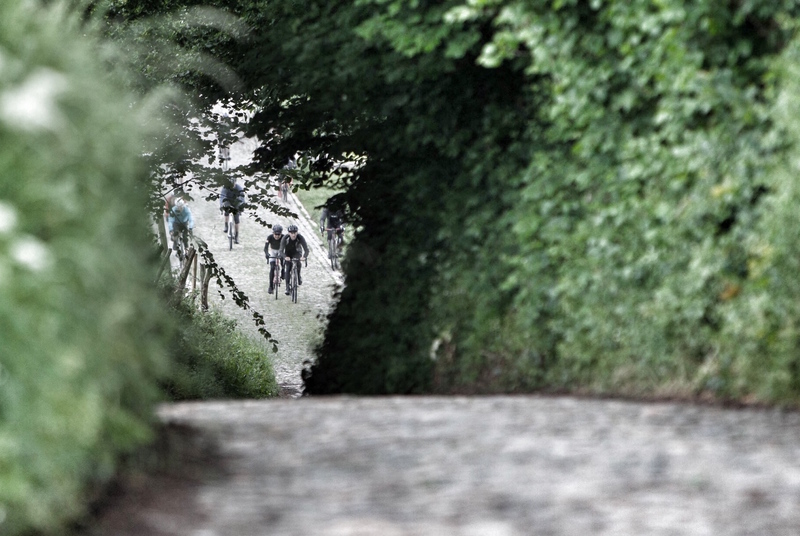 Then we hit the damp cobbles of the iconic Geraardsbergen and two riders went down in front of me. I walked the final 100 meters to the summit, unable to maintain traction. I wasn’t alone. Some classy riders walked up that climb. 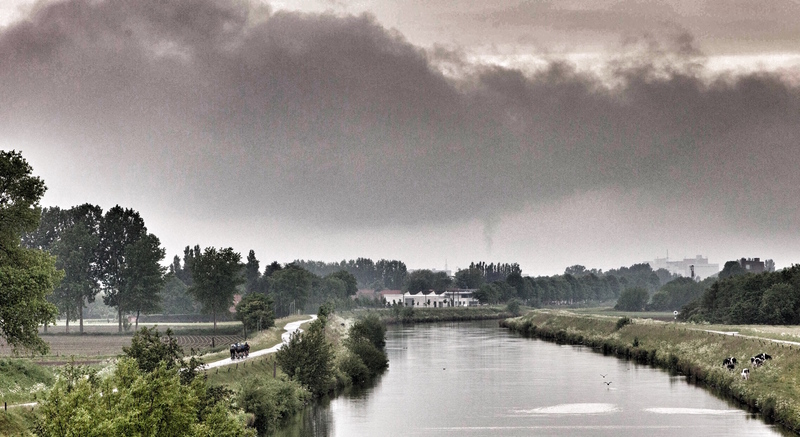 If you know your Classics, you’ll recognise this as one of the most famous places in cycling. Local hardman Walter Beckers points the way. A little while later, the heavens really, really opened. 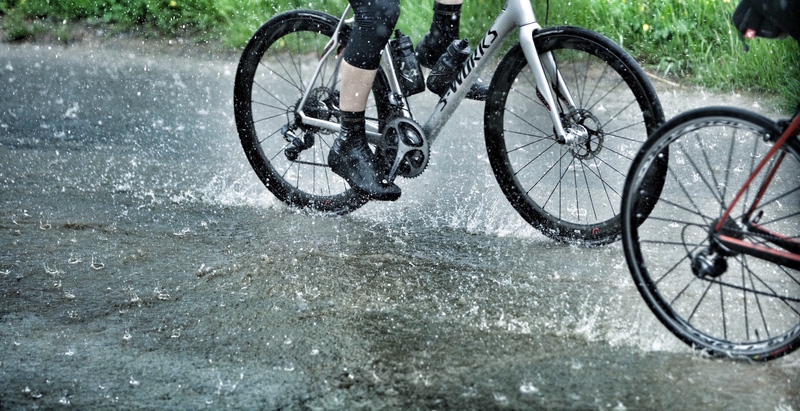 Aquaplaning at the bottom of descents became a possibility. The picture of my wheels says it all. The rain would arrive and then recede. 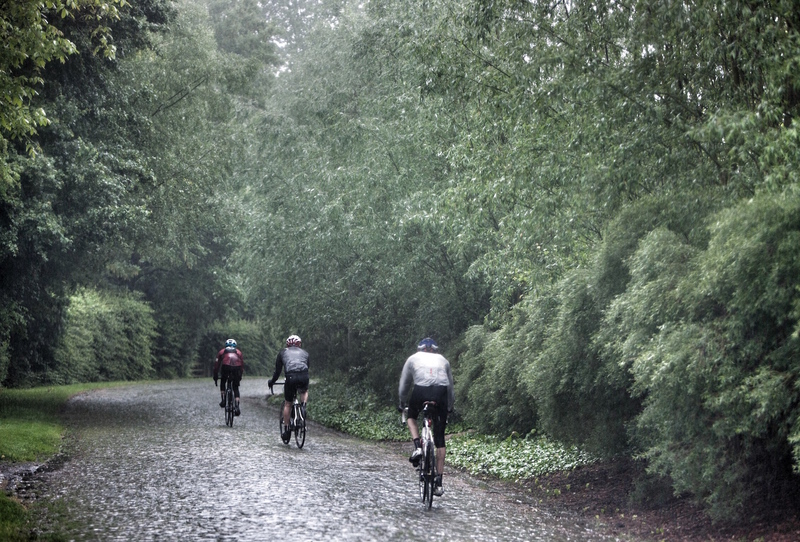 Some climbs were dry and some were wet. My wheels. This is not a puddle, nor is it a river crossing. It’s just the road in one of the downpours. Some eight hours into the day, we arrived at the main event. This was where the professional race would be decided each year. The Oude Kwaremont and the Paterberg were dry and I cleaned them both. 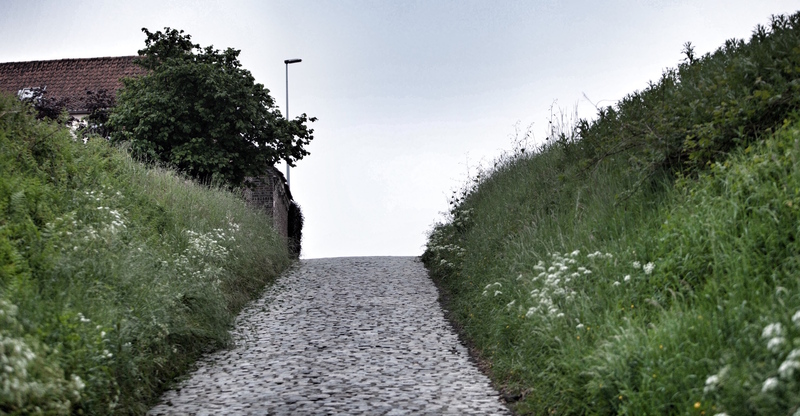 As we reached the foot of the most iconic climb of them all, the Koppenberg, the rain returned and feasible changed to impossible in the blink of an eye. Just one of our group cleaned that climb. I now understood why even the pros might have to walk up it. Arriving at the bottom of the Koppenberg. Half way up, the heavens opened and only one of us made it to the top on two wheels! It was at this point that the sky turned from dark grey to inky black. We were about 70km from home and the cobbles weren’t over. The heavens opened once more – and stayed open. The Koppenberg. Make sure this one’s on your bucket list. Terrifying. That’s how I’d describe the long, gently descending set of cobbles known as Mariaborrestraat. It was no longer just raining, but truly pouring. Simon climbed off his bike with the words “this is the worst experience of my life”. I felt very guilty. It looks OK, but it felt awful. Simon is definitely cursing me at this point! Eventually the cobbles were behind us and we time-trialled the last 50km, through the mist, the spray and the gloom, back to Ghent. It was hard to discern the road from the canal to our right and later, Phil and I pondered how easy it would have been to ride into the waterway by mistake! Cobbles finally over. Just another 70km to the finish line. Predictably perhaps for a ride of this stature, there was a sting in the tail. The streets of Ghent are cobbled and criss-crossed by numerous tram lines. Bikes and tram lines don’t mix well. I started shouting ‘tram lines’, but too late: I heard riders go down behind me. This seemed like a cruel reward for having navigated our way back to the city. Thankfully, no one did any serious damage and we all made it back to the hotel, arriving in virtual darkness. I handed my bike to Craig, our mechanic and headed upstairs, pondering how to wash and dry my kit ready for Stage Two, which would start in just nine hours time. Oh, the joys of a Cent Cols Challenge. Walter Beckers: one of nicest people you could ever wish to ride bikes with. Also one of the strongest! 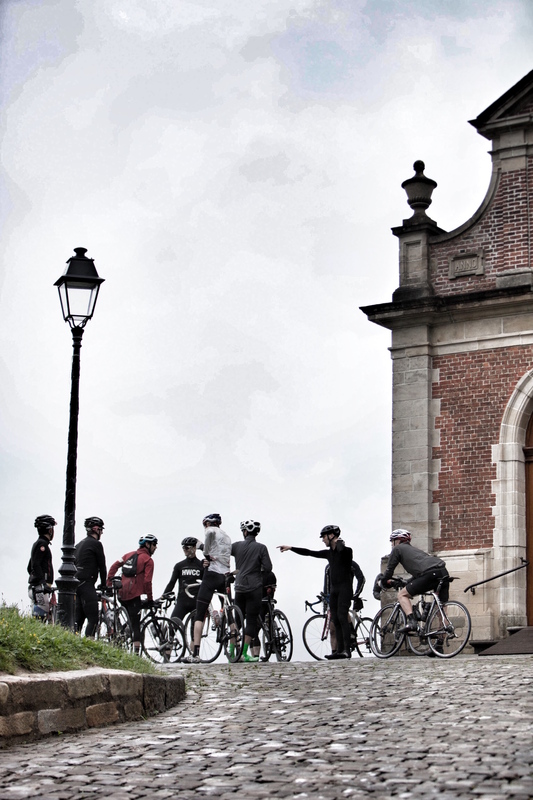 * The following day, we rode the route of Gent-Wevelgem (225km). Besides an early shower, the sun shone and our love for riding bikes was renewed. The cobbles of the Kemmelberg were dry and we all cleaned it, from both sides. Simon described it as one of his best ever days on a bike. I felt less guilty. * Simon and I ducked out after Stage Two, but the rest of the team headed for the cobbles of Paris-Roubaix. With Rapha Brand Ambassador and local hard-man Walter Beckers on the front for the entire ride, everyone made it to the velodrome. The event continued onwards and a small group of Phil’s disciples successfully rode every stage and thereby achieved something remarkable and to date, unique. * I got my tyre choice all wrong. I rode 25mm Continental GP 4000 S II’s at 110 psi. I should have taken 28, 30, or even 32mm tyres and ridden them much softer – say 70 psi. Basically, you should ride the fattest tyres your frame will take. 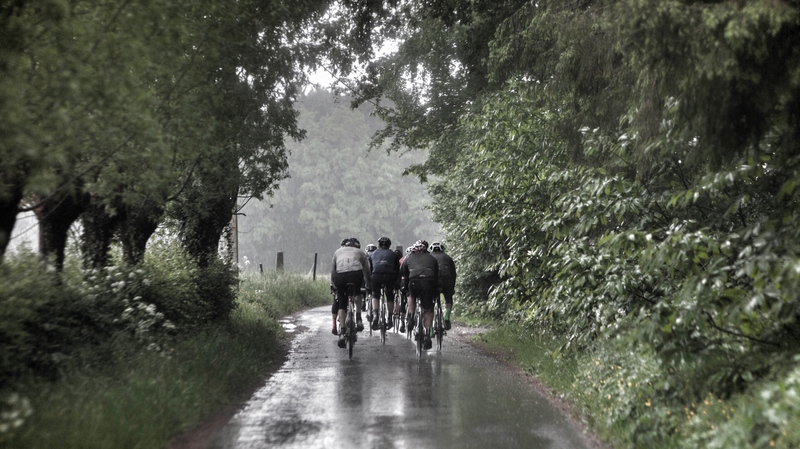 * I can’t wait to ride the Ronde again, but I’ll be looking for a dry day next time.